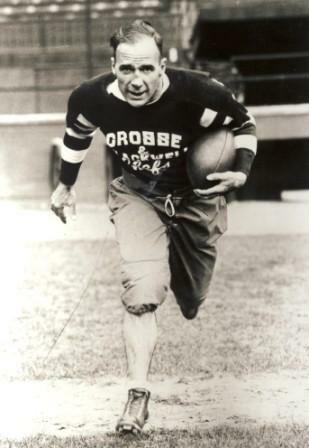 Lionel Conacher was Canada's Athlete of the Half-Century in 1950. He excelled in football, hockey, baseball, lacrosse, boxing, wrestling and many other sports. As I mentioned about three weeks ago, I’ve been doing some freelance work for Canada’s Sports Hall of Fame. The Hall is moving from its current home at the Canadian National Exhibition fairgrounds in Toronto to a new building at Calgary’s Olympic Park. The move itself is a long and protracted story - detailed in the final four paragraphs of this history – but it’s suffice to say that a permanent building is long overdue. My job is to research and write the content of displays that will be installed in the galleries of the new Hall of Fame. Specifically, I am working on entries for timelines that will be incorporated into the entrance of each gallery. These chronologies will highlight the greatest moments in the history of Canadian sport. For example, when I was trying out for this job I worked on moments for Lionel Conacher, Angela James and Jacques Plante. Conacher’s storied career had many incredible moments but I chose to focus on June 1922. In a single day he drove in the winning runs to lead the Toronto Hillcrests to the city’s baseball championship and then he took a cab to Scarborough where he led his lacrosse team to the Ontario senior championship. With James I focused on the period of March 19-25, 1990 when she scored 11 goals and two assists in just five games as Team Canada swept through the first-ever Women’s World Championship of Hockey. Of course, Plante’s tale revolved around the night of November 22nd 1959 when the Montreal Canadiens were playing the New York Rangers and the all-star goaltender’s nose was broken by a shot. After that he began wearing a mask, the first National Hockey League goalie to regularly wear one. I even added a little bit about Andy Bathgate – the man whose shot broke Plante’s nose – and that the Rangers forward had intended to hit the goalie in the face with the puck. Now I’ve got to do another 50 moments and I couldn’t be more excited. I’m still in the planning process of picking which athletes I want to do for this phase of the project but I am thrilled that I’ve been chosen to work with Canada’s Sports Hall of Fame. It seems they chose the right person for the task. Q. What’s purple and skates? I think that joke made the rounds at the time as backlash humour — A.B. had no business breaking Plante’s nose.